It is with a broken heart that I tell of a great loss. 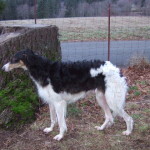 Orion went to the Rainbow Bridge July 9, 2004. His leaving was completely unexpected, and unpredictable. Orion was a heart dog, and will be loved and missed. Thanks to Am Can Ch Santa Clara Del Viento, JC and Am Can Ch Kenai’s Shooting Star, he currently has some wonderful kids, and grandkids. 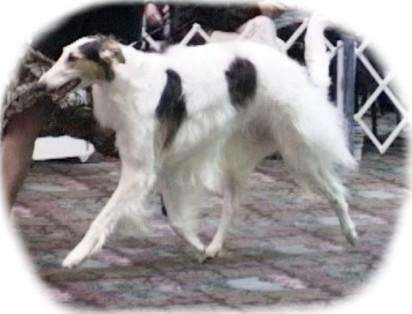 The Clara/Orion litter currently stands at 5 out of 9 get are Champions; check out the litter at www.radostborzoi.com/shownews.html for all their wins! 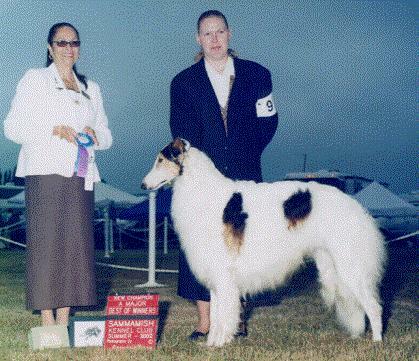 “Orion” finished his American championship summer 2003 with BOW at the TSE the day following the PSBC Specialty. Orion went to Canada and finished his championship in 3 consecutive shows, taking BOB the first day out. 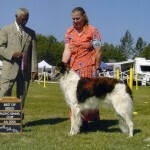 He finished his Canadian Championship by taking WD and BOS at the Borzoi Canada Nationals! Honorable mention: WD at the Western Washington Hound Association.